Yesterday I completed my first triathlon! It was so much fun. Of course I have to recount my experience for you (if nothing else to memorialize it for myself), as well as what I learned about triathlons. And yes, you get to see an rare photos of the elusive Sally. 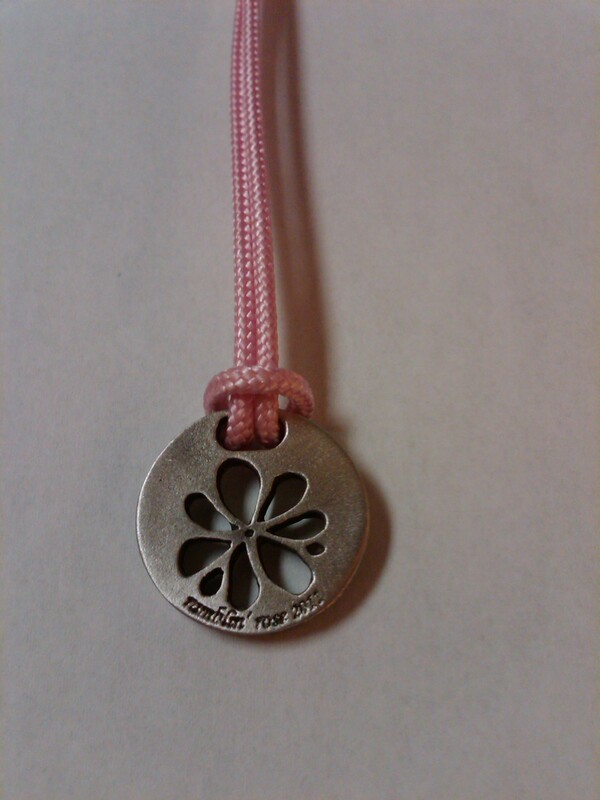 First, here is the wonderful medal/charm that all finishers got. Yeah, I’m wearing it all day today! It was an unseasonably very chilly day (in the 50s! ), so I was a little nervous after training in warmer weather to wake up to a cold, dreary day. I had prepared to do the race in my tri top and shorts, but had to pack a short-sleeve and a long-sleeve shirt in case I needed it for the bike ride. I was handling my nerves really well until I was about a 1/2 dozen people away from entering the pool. That’s the “omigod-I-really-have-to-do-this” moment, as well as the “there’s-no-backing-out-now” realization. 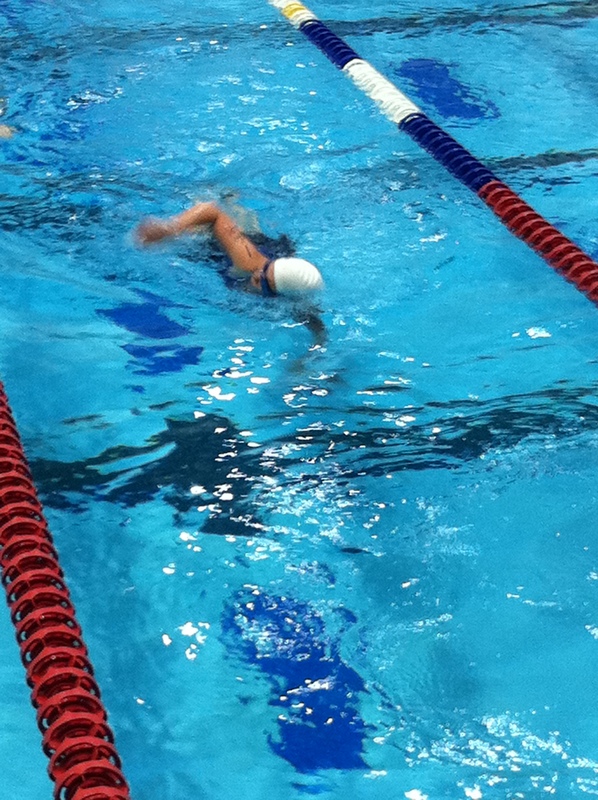 When it was my turn, I just got in the water and pushed off the wall. Probably because of nerves I was having some trouble regulating my breathing the first couple laps, but got it under control and even passed a few swimmers! Ok, you can't really see me well, but that's me swimming! Once out of the pool, I ran barefoot while pulling off my goggles and swim cap to the very cold outdoors and onto the gravelly pavement to the transition area. First things first, wipe off my face, adjust my ponytail, and clip on my bike helmet! I rinsed off my feet and put on socks and shoes. I felt ok enough to forgo the extra shirt and decided to chance it in my wet tri top. Took my bike off the rack, grabbed my bike gloves and sunglasses, and tossed a few Sport Beans in my mouth. Then, I ran carefully with my bike to the mounting area. Once on my bike I was on my way. I was easily moving along at a good clip and shouting “on your left” to several other bikers! I was feeling really good. I managed the hills and sharp turns well and didn’t get too winded. Returning to the transition area, I ran my bike back to the rack, removed my helmet, gloves, and sunglasses. I clipped on my race belt with my bib number and put on my running hat (hello swim/sweat/helmet hair!). Grabbed some more water and popped a piece of gum in my mouth and ran out the transition area. A couple volunteers shouted that I looked really strong, so that really helped boost me as I took off into the park. Two laps, that’s all I had to do. After the first lap, I realized I was running faster than I ever have. I joked with myself (runners have crazy thoughts while they run) that I was going so fast because I was trying to safely skirt the dozen Canadian Geese on the path (geese are mean little creatures). As I headed into the finish I realized I had enough steam to sprint to the finish line. 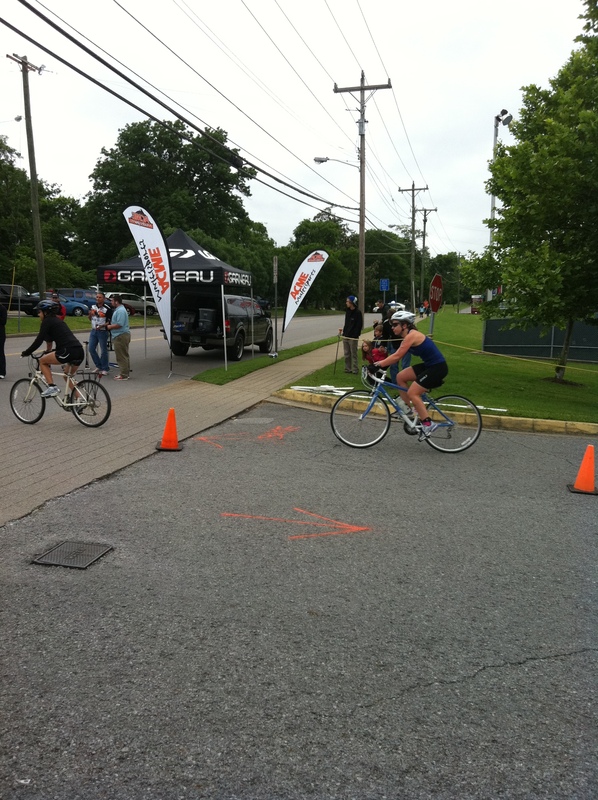 They announce your name and that you’re a “triathlete” at the finish and it really feels good! When people find out you’ve done a triathlon, they are immediately impressed and call you things like superhuman and a machine and inspiring. Enjoy it! It doesn’t matter how bad or good you are at any part of the race, it’s the total time that matters. You can make it up in other areas. You actually have 6 different times: Swim, T1 (first transition), Bike, T2, Run, and total overall time. A lot of other people out there don’t know what they’re doing, or at the very least don’t know their swim times. You’re not the only one. It is a totally achievable goal! Pick a small sprint race like this one and go with it. Things are going to go wrong. You can let them control you or you can just ignore them and power through. Seeing a familiar face as you’re pushing through the course is really reassuring. Beloved showed up and it was nice to see him smiling! This is truly an individual sport. You most likely will not see the same people at any point in the race and will have no idea how well someone is doing based on where they are in the course. Just focus on yourself and finish the best that YOU can. Yeah, some of that was on my face in the morning. Your age according to the USAT, is whatever your age is on December 31st of that year. Therefore, I am always a year older because my birthday is 3 weeks before the cutoff. 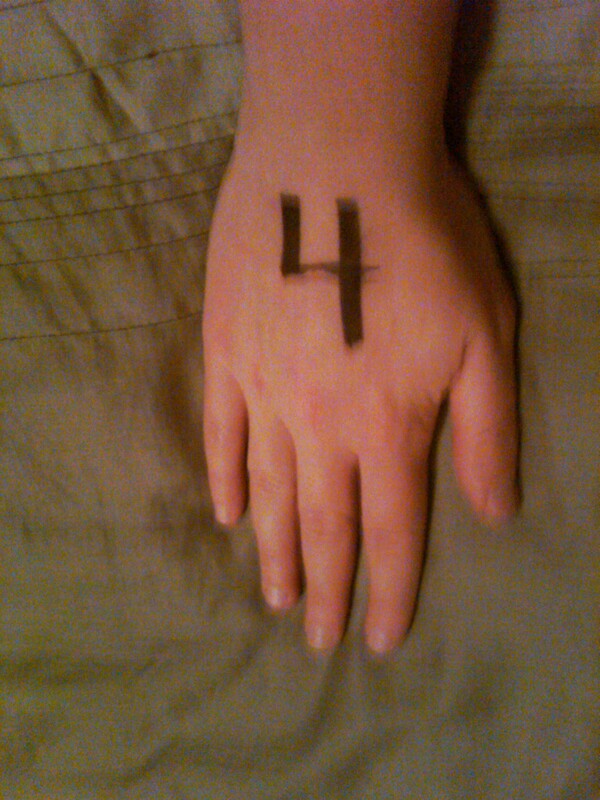 Also, they mark your age on your calf! You will have to put a sticker on your bike and your helmet. But don’t worry, it’s a sticker that’s easily removable. Now why can’t the rest of the world use stickers like that? This race was an incredible first race. It was for women only, so that made a great environment for the nervous beginner. Also, women athletes are usually much more supportive of each other and more likely to be polite to each other in competition. The race was excellently organized. I was never unsure about where anything was or how the race was going to run. The course was clearly marked and all of the race officials and volunteers were more than available to answer questions and help. The excitement and support on the course were amazing. It was great to see women of all ages and abilities out there, but also to see all their friends and families out there to see them on that very early, very chilly morning. I would do this race again in a heartbeat, or any race that the race director and their organization puts on. If they come back again next year, I’m definitely doing it again. I know that the bar has been set high for my next triathlons (the next one is in 2 weeks), so here’s hoping I enjoy those at least half as much as I enjoyed this one. It’s been a little while since my last Helpful Hints post and I’ve got some new ones just in time for Spring! I hate these little “buggers” getting into my house. Where there’s one, there’s an army of millions. I’ve posted before that they don’t like to cross a trail of CINNAMON, and that usually works for me to help keep them out. But what if they are already in the house. I had a recent problem with ants in my dishwasher! Yes, imagine! They were either coming from the pipes or just attracted to the water. Freshly washed dishes were covered in ants. You can’t use chemical bug killers in the dishwasher either (um, hello poison! ), so a little research turned up VINEGAR. Just pour some white vinegar into the dishwasher making sure to get all possible entry points for the ants (drains, places water comes out) and let it sit. Overnight should be fine. Then run the dishwasher (with no cleaner) on the hottest setting you have. It may take a few treatments of this to fully get rid of them. Outside the dishwasher, you can kill/clean up the ants with any regular HOUSEHOLD SPRAY CLEANER. Make sure to thoroughly wash down any trails they are using. Then follow up by rubbing down the area with some PEPPERMINT OIL. They hate the smell and won’t use that trail or go near it again. Also, the vinegar trick works for sinks. After a very overzealous run this morning, I was battling some pretty bad nausea. Usually GINGER (ginger ale, ginger flavored candy, etc.) will do the trick to settle the stomach. But I didn’t have that luxury at my disposal. I put out the call on Twitter to find a remedy. An well-known trick is to sip some SPRITE, which was very helpful. You can also eat some BLAND CRACKERS if you think your stomach can handle it, which I wasn’t so sure would work for me. I was also told to sniff some RUBBING ALCOHOL. I actually had this handy in our first aid kit at work. As crazy as it sounds, it actually works because it confuses the receptors in your brain that cause the nauseous feeling. I also got advice to either sniff LEMONS or drink LEMONADE, both of which were not immediately handy. I am assuming this works on the same principle as the rubbing alcohol, and lemon flavor can also help settle your stomach too (just be careful not to get too much of the citrusy acid). Ever pull out an old (or even not that old) jar of Play Doh and it’s all dry and crumbly? Either you’ve got kids, you only occasionally play Cranium, or you’re just a crafty kid-at-heart. But it’s the worst and there’s nothing you can do with this worthless glob. Actually it can be salvaged. Just wrap the dough in a DAMP PAPER TOWEL and MICROWAVE for five seconds. If it’s not doughy enough for you yet, add another 5 seconds until it is just right. (Just be careful on how long you nuke it, you don’t want to bake the dough.) Ta da! I hate when a salt shaker gets all crusty from the salt, or the salt clumps together and you just can’t season your food properly. Enter RICE grains. Just place a few grains of dry rice into the shaker. It not only helps keep the salt grains separated, but it acts as a dehumidifier and helps keep the moisture out that causes all that clumping and crustiness. If you’ve every wondered why some restaurants have rice in their salt shakers, that’s why. It’s not because some creepy person was putting their food into the salt shaker. Ever buy some asparagus or celery or kale and after only a day or two in the fridge it gets all wilty? Have no fear, the veggies have not gone bad, they’re just in desperate need of a drink. Place the veggie with the cut stalk or root end down into a glass or bowl of COLD WATER. I prefer to use a large glass if I can to help stalks stand up, but as long as they are getting the water they will perk right up! I have also heard you can put veggies in a bowl of ice water and salt for a quicker perk up, but you have to be careful about the amount of salt you use. I usually just let them sit overnight in the fridge and they’re good to go the next day. It’s amazing how something so very tiny can cause so much disturbance. If you pick at it you could either push it further in, or even worse cause infection. And then there’s the dreaded needle solution most people don’t have the nerve to take on. Sometimes splinters will work themselves out, but not without prolonged discomfort. The safest way to remove a splinter promptly is with GLUE. Just place a drop of glue on the location of the splinter. Once the glue has dried, carefully peel it off of your skin. The tip of the splinter will stick to the glue and pull right out. Be sure to thoroughly clean and disinfect the location after the splinter has been removed to avoid any infection. Please note that this will only work with a splinter that hasn’t been pushed too far under the skin and with glue that will actually peel off of the skin (i.e., super glue may just lock it into place or risk pulling on the skin too hard if you try to peel it). Do you have any tried and true remedies for these little issues?